What can you do to be ready for your little one? Take care of you! 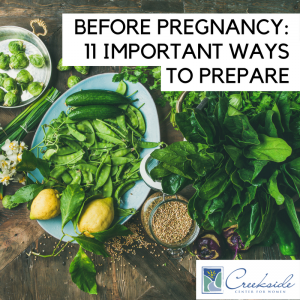 Before you even begin trying to conceive, you can take important steps to prepare your body and your life for a new baby. Months before you begin eating for two, you can focus on eating well to boost your levels of protein, iron, calcium, and folic acid. Eat healthy by choosing fruits, veggies, nuts, such as almonds and cashews, whole grains, and dairy products. Cut back on processed foods, baked goods, soda, and other junk foods. It helps prevent serious birth defects that can happen before you know you’re pregnant. Folic acid in many foods, including leafy greens, citrus, and beans, but most women need a daily vitamin to get enough. When you’re planning a pregnancy, you need 400 micrograms of folic acid every day, the amount in most multivitamins. Proactively get in shape to make your pregnancy and delivery easier. Aim for 30 minutes of exercise that gets your heart pumping. Walking, bicycling, and swimming are great ways to get a workout. See your doctor a few months before you begin trying to get pregnant. Ask about tests or vaccines, prenatal vitamins, how to deal with any existing health conditions and medications. Pregnancy raises your chance of gum disease, a health problem that may also make early labor more likely. Have your teeth cleaned and checked, and brush, floss, and rinse with an antiseptic mouthwash daily. Smoking or being exposed to secondhand smoke during pregnancy can increase the risk for infertility, premature birth, low birth weight, and miscarriage. It also puts your baby at risk for sudden infant death syndrome (SIDS). Since you don’t know exactly when you’ll get pregnant, play it safe and avoid alcohol now. Not only can alcohol make it more difficult to conceive, drinking during pregnancy raises the chances of birth defects. The average middle-income family in the U.S. will spend $12,000 during the baby’s first year. Just think, infants go through about 8,000 diapers before they’re potty-trained! Besides, diapers, you’ll need clothes, a crib, a car seat, a stroller, and maybe formula and bottles. Make a list of supplies and start looking now. Your expenses will also include pediatric visits and possibly childcare. To stretch your dollar, consider gently used baby clothes, buying in bulk, and family daycare. If you work, consider what you want to do once you’ve had your baby. Some companies provide paid time-off after you give birth. Others offer unpaid time-off. You may also be able to use sick days or vacation time before you go back. Check your health plan, too, to see which doctors and hospitals it covers. Whether you and your partner go to an elegant, non-kid friendly restaurant or an exotic location, this is a good chance for some “we” time before you’re too uncomfortable, you can’t travel, and you’re both focused on being a parent. A crying infant that suddenly shows up could make your pet upset or agitated. Help him adjust now by bringing baby supplies, including lotion and diapers, into the house so he can get used to the smells. Also set new rules, like staying off furniture or out of the nursery.